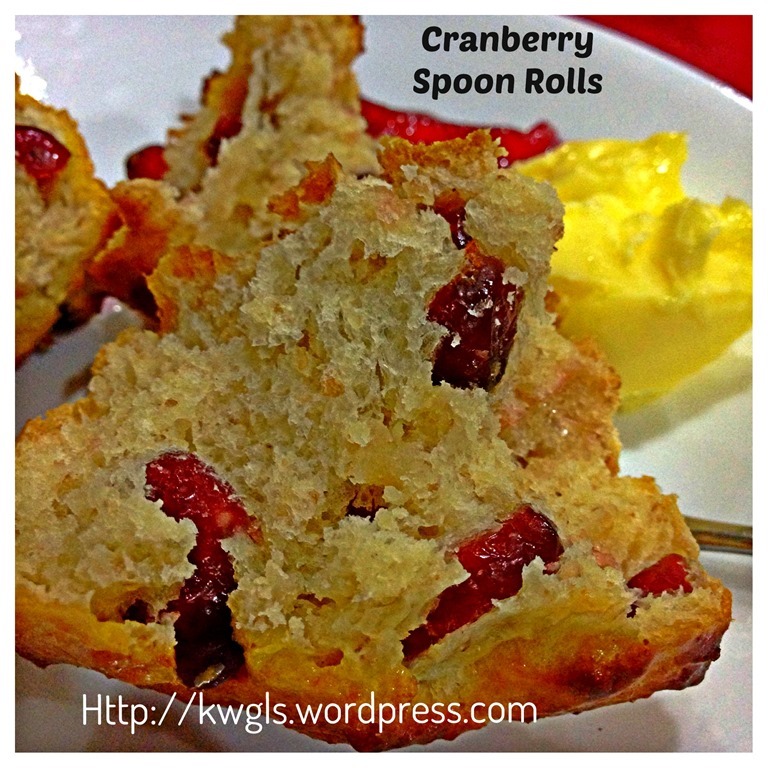 There was once I told one of the members in a Facebook Food Group that as a blogger, my responsibilities are trying out new recipes and share with readers when I thinks that it is a good recipe and readers may like it. 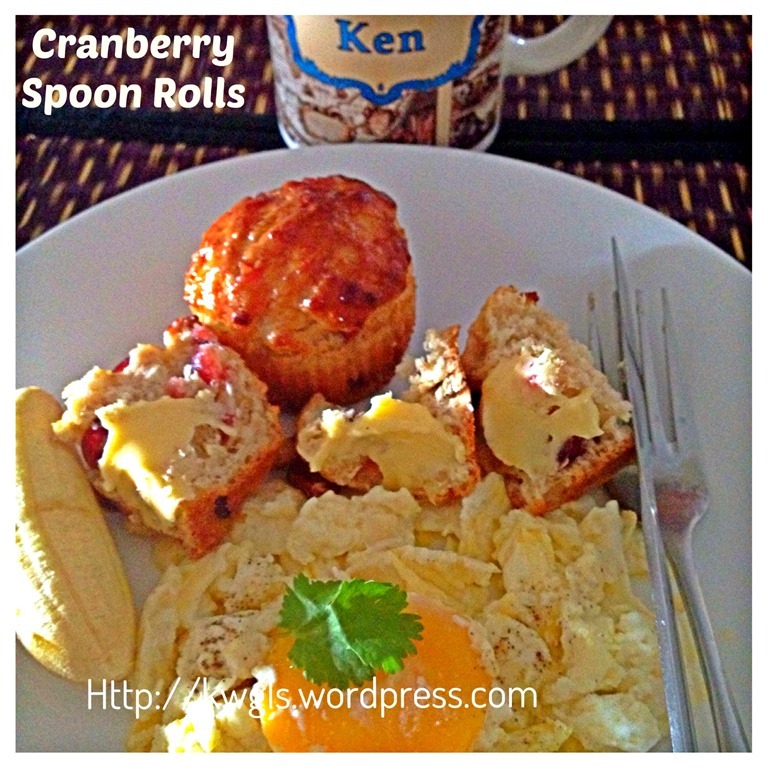 I am in the Google Plus Food Communities, Facebook Book Food Groups and Blog Hop Parties etc. I am constantly exposed to new cuisines (as far as I am concerned) and for those recipes that caught my attention, I will give it a try and share with readers. 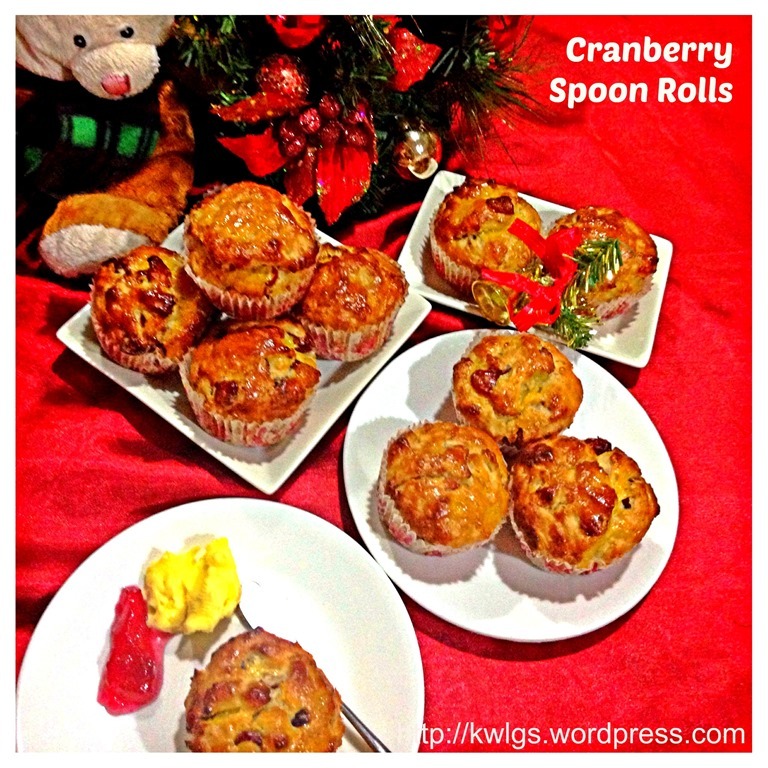 Yesterday, in one of the Facebook Groups, I have came across this spoon roll recipe from http://otasteandseeblog.com. When I visited her blog, I was rather amazed by the way the bread was prepared. It was simple and most of all, there were no kneading and second proofing. 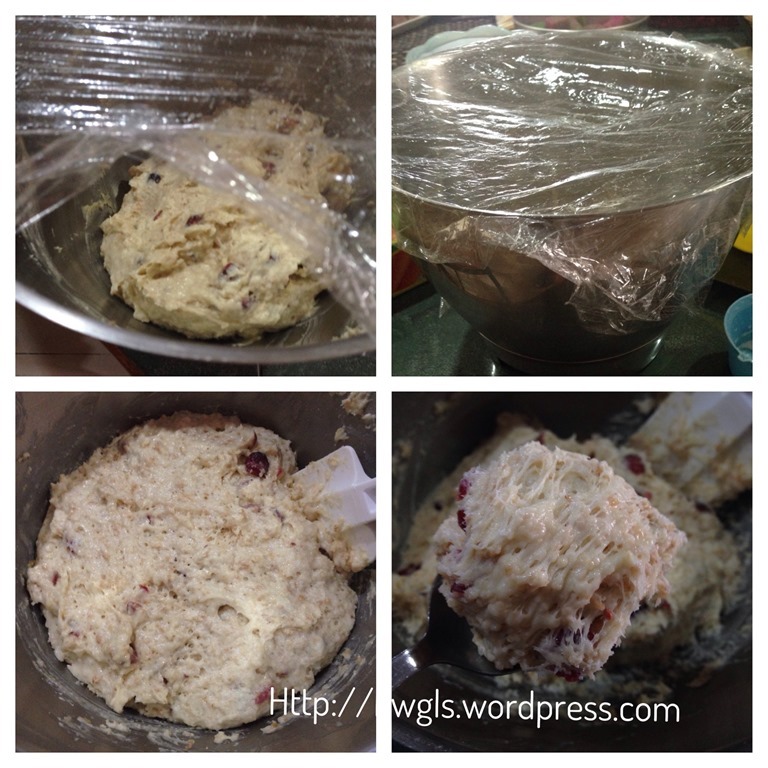 Sorry for my ignorance, this is the first time I heard that no kneading required and spoon was used to transfer the bread dough into the baking tin. Well, it can be a form of quick bread but what differentiates this with quick bread is the use of yeast as a rising agent as compared to the use of baking powder as a leavener. 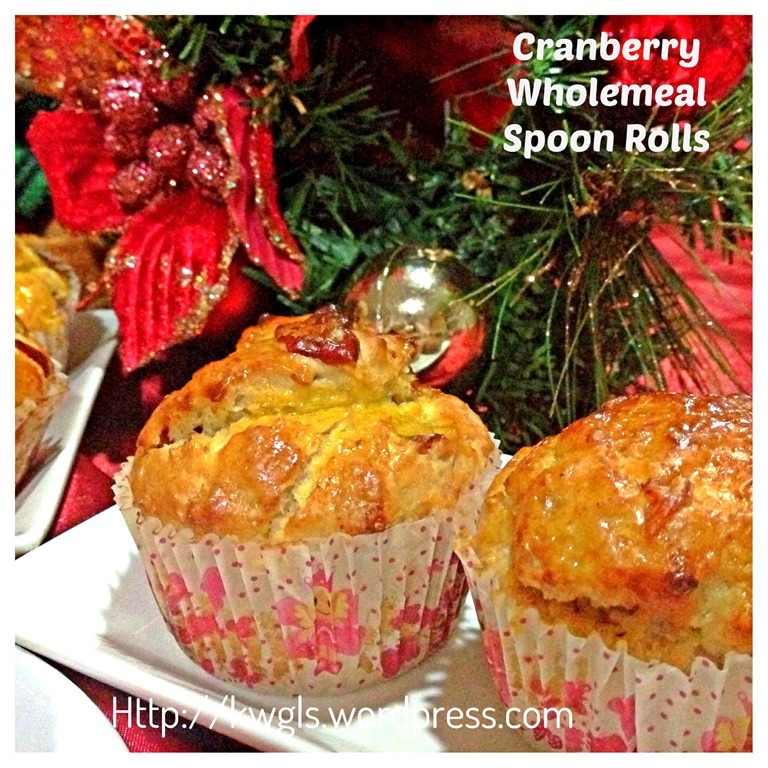 Since I have all the ingredients and it is rather easy to prepare, I have decided to prepare these spoon rolls. As I have some wholemeal flour sitting in my shelf for quite a while, I told myself I might as well used them to prepare the wholemeal rolls. Christmas is about 20 days away, I have decided to modify the recipe to make the rolls into dinner rolls for Christmas feast. 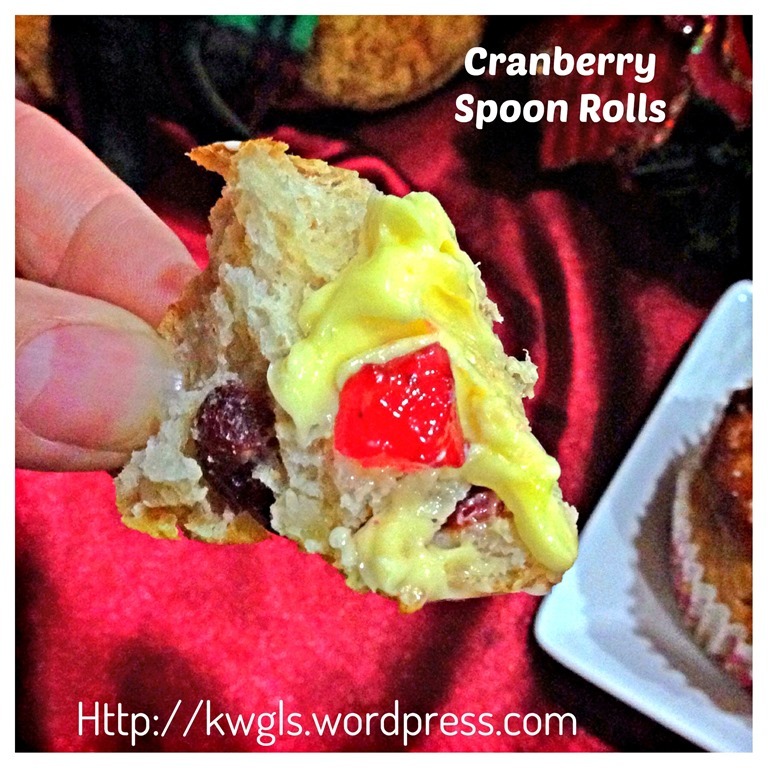 Since it is a Christmas bread, cranberries were added to balance the greasiness of the meal and the red celebration colour. As with all other Christmas cuisines, the bread should “put on some nice clothing and make up” before they “sit “ presentably in the Christmas dinner table. Therefore, I egg washed my rolls and give them cupcake cups to make them looked “more elegant”. Concerning whether it will be harden in the next few days, I have resorted to substitute the milk with some fresh creams. The result of this rather simple spoon roll is satisfactory. Though it looked hard like a a rock bun, but it is soft inside. The exterior look is due to egg washing of the rolls and resulted in a crispier texture. On the second day when I have my breakfast, it still remain soft as it was just out of the oven. Note: If you want it to be a healthier version, substitute the vegetable shortening with olive oil and instead of using fresh cream, use fresh milk. 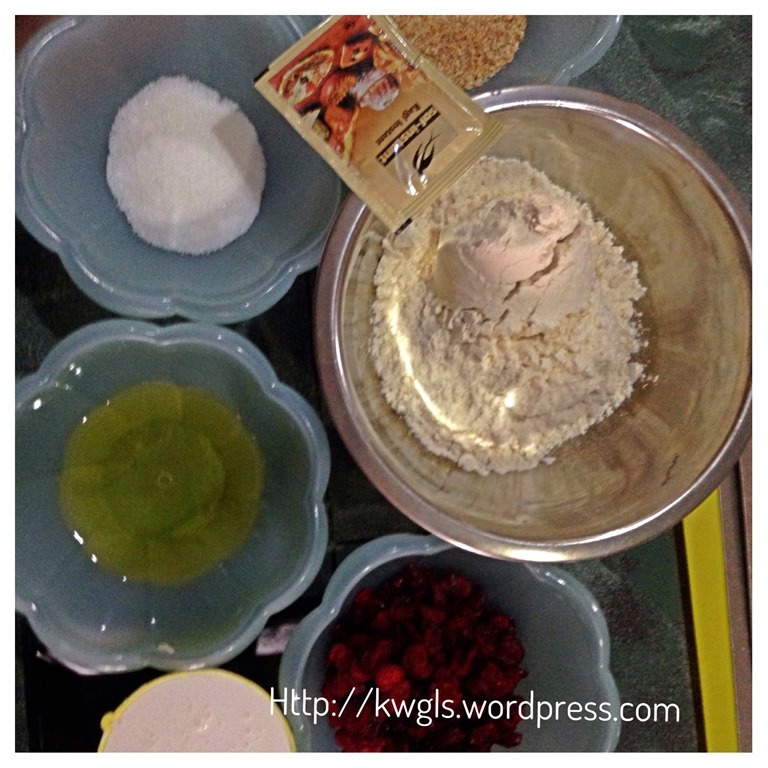 Put all the dry ingredients (wholemeal bran, wholemeal flour, sugar, baking powder, yeast, cranberry) in a big mixing bowl. Stir and make a well. Add in the liquid ingredients (eggs, cream, milk, melted vegetable shortening). 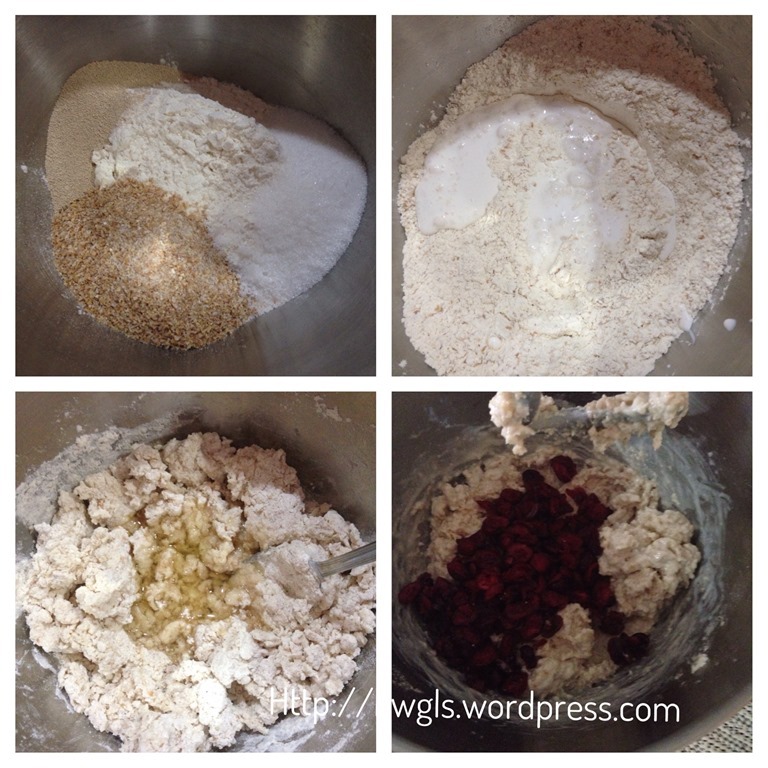 Use a stand mixer to mix at low speed until well mixed. 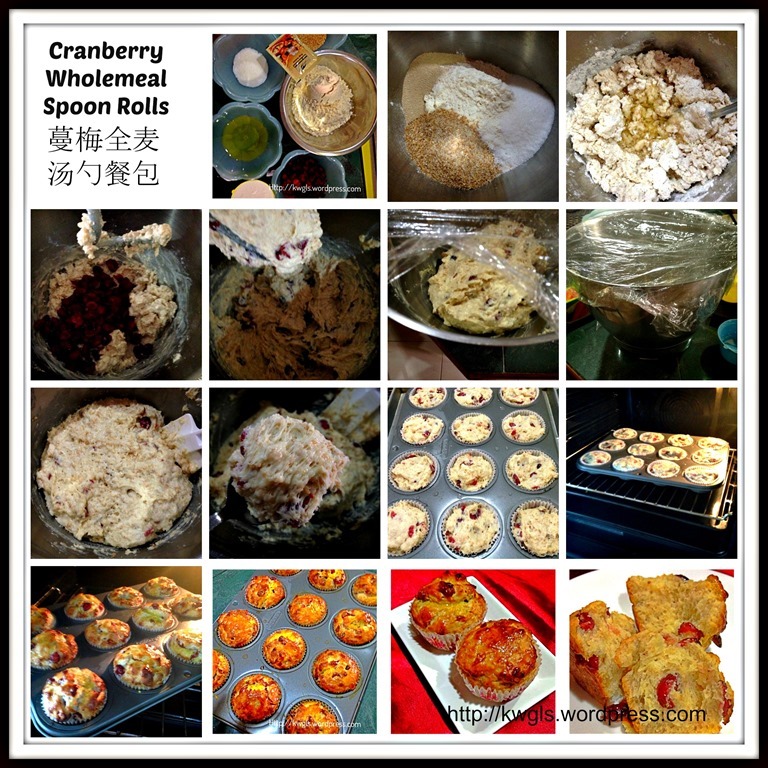 In this illustration, I have put the cranberry later for image taking purposes but you can just add together with all other dry ingredients. If your whisking bowl is tall enough, you can leave your dough inside the same bowl, use a clingy wrap or wet towel to cover it. Otherwise, transfer the dough to a tall container. Proof the dough for 3-4 hours. After proofing, you are likely to see the dough volume has expands with yeast aroma, soft and full of holes. That is normal as it is a fermentation process of the yeasty dough. 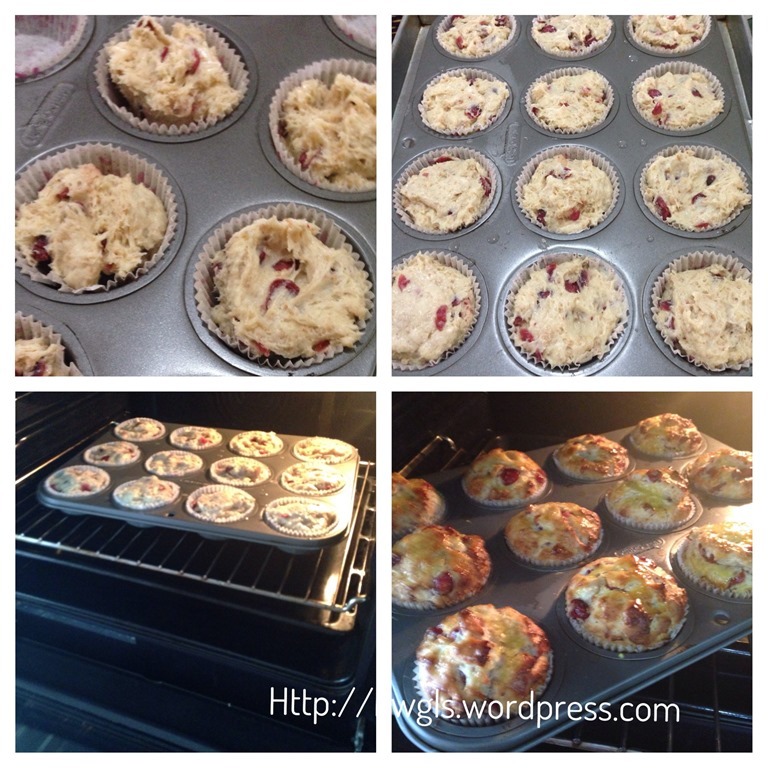 Before transferring the proofed dough to the cupcakes cups, pre-heat your oven to 190 degree Celsius. Put cupcake cups in the muffin trays. Transfer the sticky dough to the cupcake cups equally. Level it if necessary. Bake in the preheated oven of 190 degree Celsius for 15-20 minutes or when a skewer inserted into the bread, the skewer comes out clean. After 20 minutes, open the door and egg wash (optional and see below) the spoon rolls. Continue baking for another 5 minutes until all the eggs dries up. Note that if there are sign of getting burnt, reduce the temperature by 10-15 degree Celsius or turn the top heat off. For egg washing, mix one egg yolk with 1 tablespoon of water, stir well and brush on top of the spoon rolls. You can wash several times until your desired colour tone. 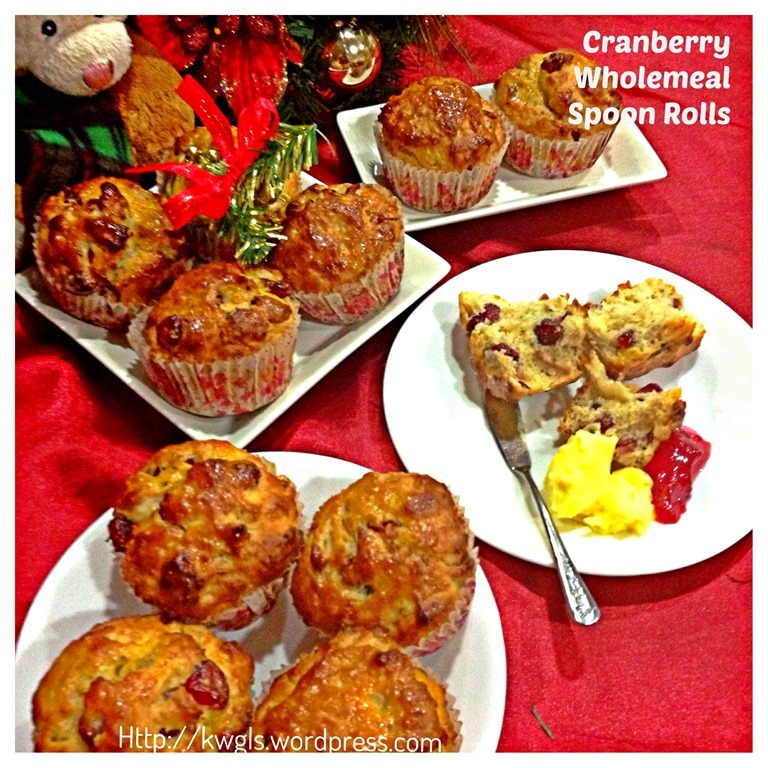 When out of the oven, transfer the spoon rolls out of the muffin tray for cooling before serving as dinner or breakfast rolls with desired spreads. I will continue to explore new recipes to share with readers. In Asian, bread was confined to buns and loaves resulting from continuous kneading. 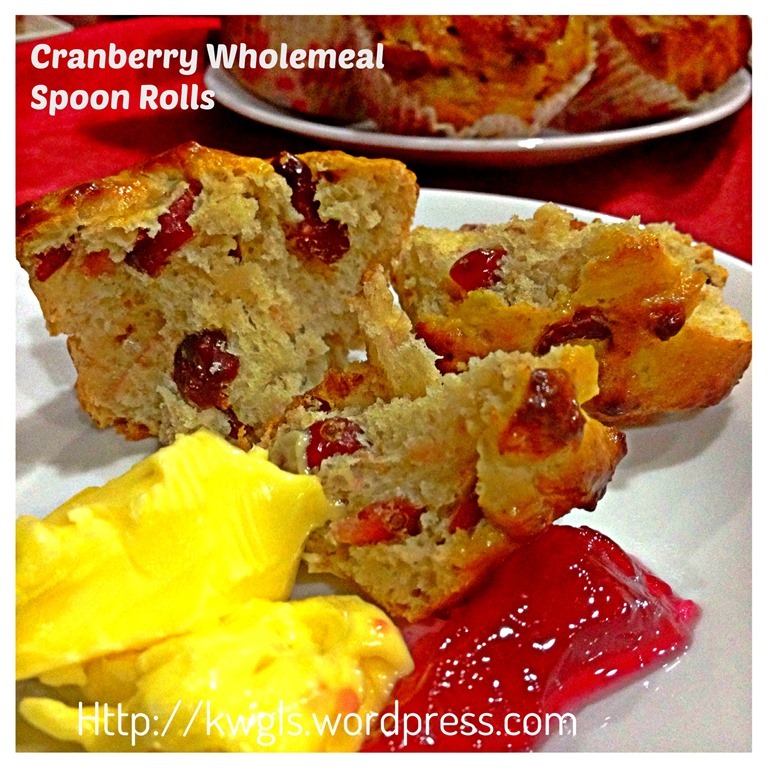 However, quick breads and spoon rolls are equally delicious. The good thing about this recipe is you need very little attention to the entire preparation process. Just mix, proof and bake. I especially like the yeasty flavour in the rolls. The slight tangy flavour from the cranberry will prepare your palate for other more sumptuous Christmas dinner feast items. Hope you try making it and a recommended bake for those house chefs who are new to making bread. If you are looking for FOUR SEASONS BLOG HOP, please join us for the fun HERE.. 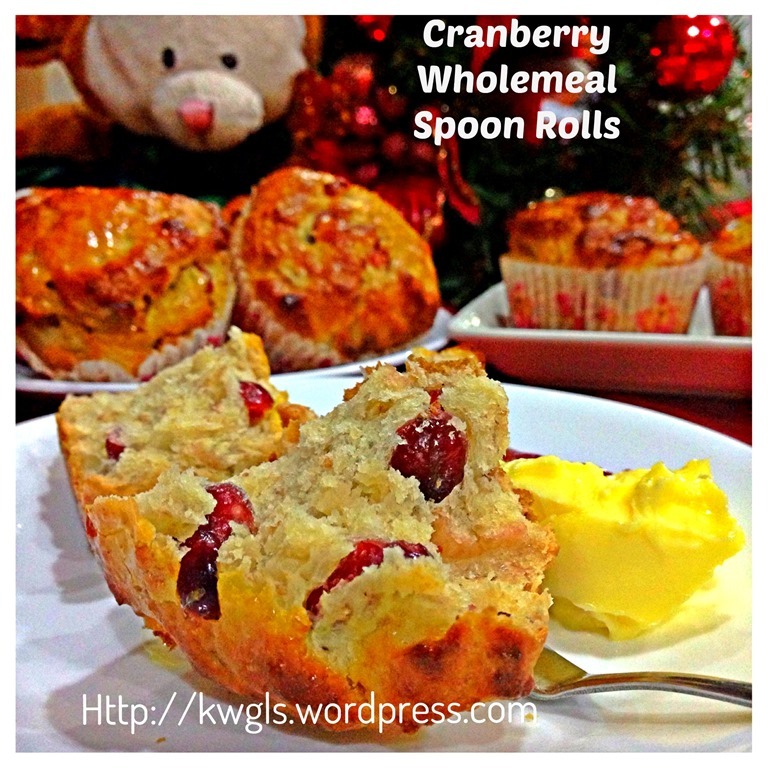 This entry was posted in Breads and Pizza, Christmas 2013, Food Preparation Series and tagged 8, Christmas Dinner Rolls, Cranberry spoon rolls, Cranberry Wholemeal Dinner Rolls, GUAI SHU SHU, Guaishushu, kenneth goh, postaday. Bookmark the permalink. What a great idea Kenneth! 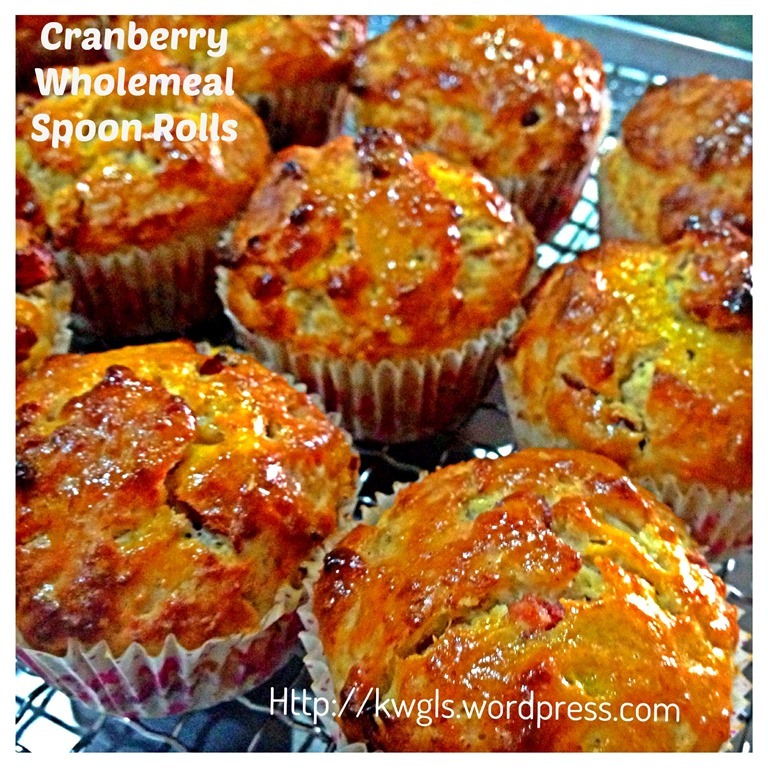 Thanks for linking back to me and trying my recipe! You have inspired me to try some other new things with this recipe. Have a wonderful day and Merry Christmas. These look like a great option for Christmas dinner. 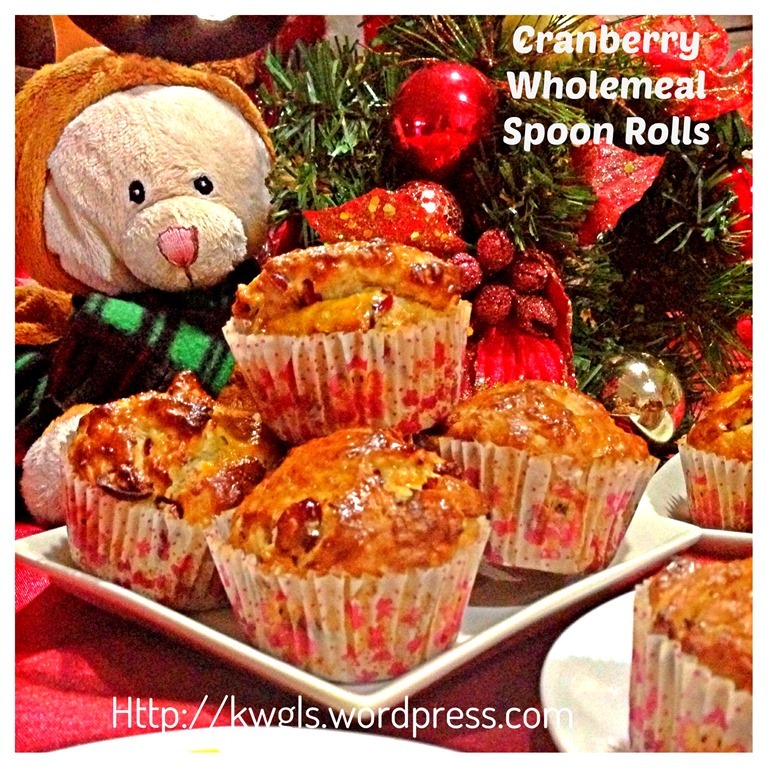 Hi Kenneth,the addition of cranberries definitely makes these rolls festive. Thanks again for linking! I love your step by step instructional photos…great for visual bakers like myself 🙂 Looks yummy!